He’s been coming to my yard for several weeks now. I don’t really know for sure that HE is a HE – it just feels that way to me. He crawls under the fence and drags his broken body up the hill. I can tell his eyesight is impaired, but he always finds the sunflower seeds scattered in the yard. He grabs a pawful of the precious morsels, stands up and immediately falls over. 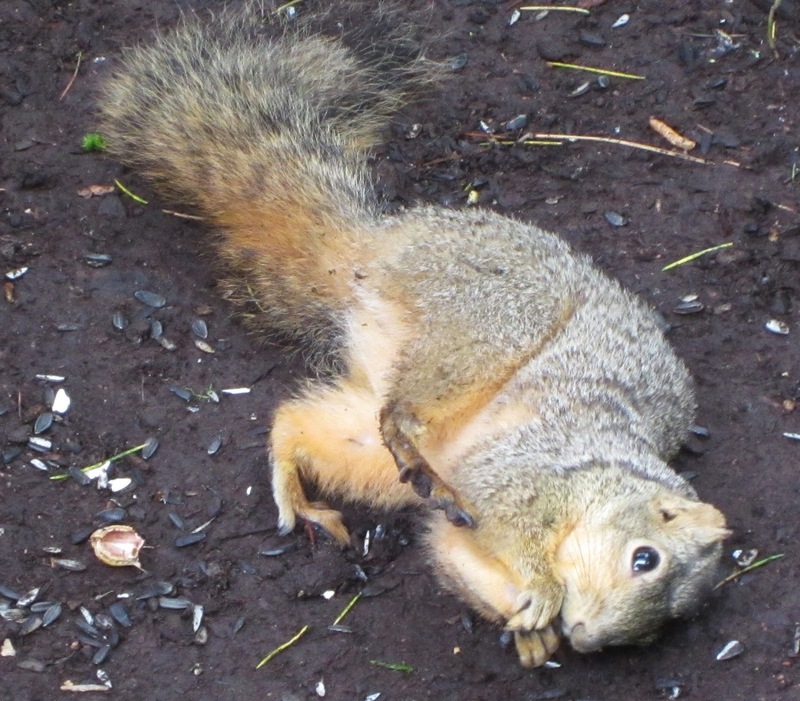 Unable to stay in an upright position, he rolls over on his back and enjoys his feast. When the seeds are gone, he rights himself and crawls around until he finds more goodies. Then the eating routine begins again. This goes on for hours. And OH, the delight when he finds a peanut! 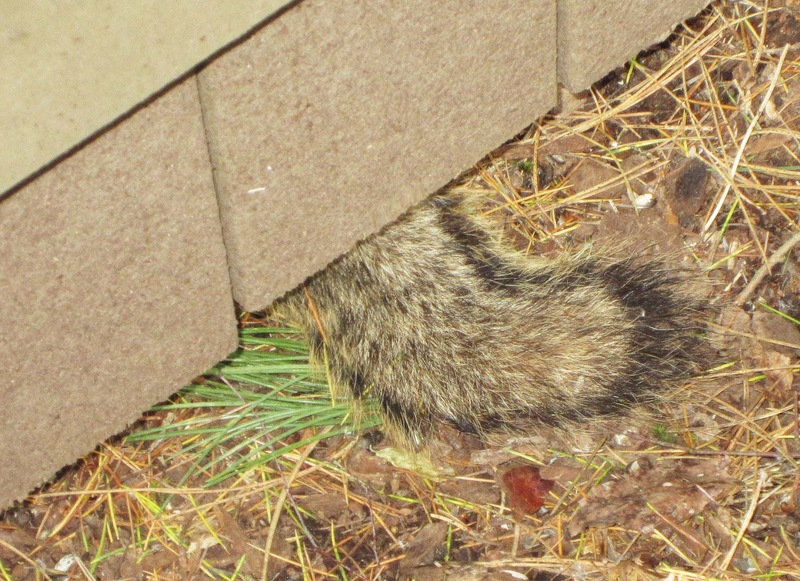 When his belly is full, he crawls down the hill and heads out of my yard, his tail disappearing under the fence. Sometimes he doesn’t show up for a week, and I wonder if my little friend has gone to squirrel heaven. Then I notice him on his back, in the middle of all the other squirrels, and my heart is overjoyed to see him, again. He lives a simple life, and despite his challenges seems to find joy and delight in everything he does. What an amazing story! I’m so sad for the little squirrel, but what a great life lesson! I couldn’t stand it, & I would have to take him to a rehab person who deals with small animals. It is so dangerous out there for him, & he doesn’t even know it so it is up to US to help him! It doesn’t matter how cute he is..he needs help! Charlene, as I wrote on my FB page I think if you could see this sweet little squirrel you would feel more hopeful. I don’t know why he can’t stand up. He doesn’t seem to have a bad leg, which might explain why he can run so fast and even run up trees. 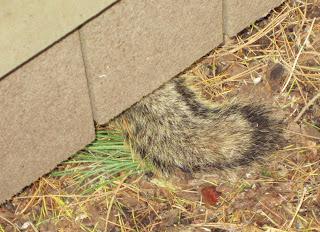 As I mentioned, I have a 110 ft rock wall(7 ft. tall) that is home to ground squirrels and chipmunks. They live in the wall in the winter and bring our their babies in the spring, so right now my yard is literally overflowing with adults and babies. Several species of squirrels visit the yard, and it’s common to look out and seee 50 of them running around.I have taken many injured squirrels and birds to the widlife care center, but those were always on the ground and not moving, so I was able to pick them up without further hurting them. I don’t know how I would catch one fast squirrel in the middle of so many others. Have you had experience with this – maybe you could advise me? Stacy, this little guy has touched my heart, and seems to have touched others as well! Omg, what an amazing story of the will to live. He might be a good candidate for a wildlife rehabber. Layla, he really is an amazing squirrel. He doesn’t show up every day, so it’s a real treat when I look out the window and see him!